After taking stock of your organisation’s social maturity, it’s time to ask a few questions. First, where have you already or where do you plan to deploy social programs and against which goals? In either case, avoid considering social in a vacuum. Take the time to understand where it best fits your organisation and how to integrate it into existing organisational and departmental goals. You’re not reinventing wheels for social, just using it to make the ones you have turn faster. Where will it allow you to reach the customers or stakeholders who most crave deeper, richer dialogue? Perhaps it’s the marketing department, the traditional home of social media in business, but that’s not a given. Perhaps it’s HR? Maybe you’re better to consider developing a robust internal social ecosystem, harnessing the power of inward-facing social before you look outward? How are you going measure and quantify the success of social programs? Look beyond vanity metrics such as Likes and Follows and try, for example, to find a direct link between conversation and conversion. Focus on influence and analytics over inflating a group size or follower base. What can you reasonably afford to dedicate to social in terms of time and tools? The allocation of human resources is far and away the most significant cost tied to social. What will your team(s) look like? Identify leadership within your organisation or begin the hunt to find it from the outside. With your team(s) in place, educate and cross-train team members so that they can be rotated across different areas of specialisation. Empower your people. 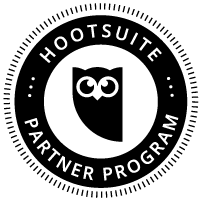 We practice this at HootSuite as a way of providing our people the ability to engage our customers multi-dimensionally rather than silo-ing expertise department to department. Look for a reliable and scalable social tool that centralises control over your social platforms and puts the power to listen, engage, collaborate and analyse in the hands of your do-ers, practitioners and experts. Make decisions about which platforms you will be active on or where you may need to consolidate existing accounts. Observe the largest organisations in your industry vertical and learn from their successes and mistakes. Engage them in conversation about the future of social in your industry. Look deeper than the usual social suspects like Facebook and Twitter to other platforms like Quora or Get Satisfaction where you may have existing communities of powerful unpaid social advocates already at work on your behalf.